Dogs will yip, they’ll yap, and they’ll jump for joy with this Hot Pink Zanies® Neon Big Yelper around! 7" long plush dog toy with squeaker. 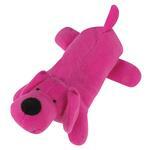 Hot Pink colored dog-shaped toy. Every Yelper needs his own Big Yelper Dog Toy, right? This Hot Pink Big Yelper will ensure your pup has a cheery companion to play with. This dog plush toy is perfect for tossing for a game of fetch. The many appendages that this plush dog toy has means you have a pretty good chance of finding a drier spot to handle for the toss! This plush stuffed animal dog toy is perfect for dogs who need a comfortable cuddle buddy to play with, sleep with, and even chew a little. While it's not a toy for heavy chewers, it does feature a pleasing squeaker to entertain your pup. This is a great item to include in a doggie Easter basket, for Valentines Day, or new puppy gift pack, but it will be a favorite year round and for dogs of all ages! What a cute plush dog toy for your pup to enjoy for hours on end! 100% polyester fabric and polyfill. Squeaker inside. Zanies Pet Toys are made from top-quality new materials and are quality tested for safety and durability. Caution: Do not allow your pet to play with any toy if it becomes torn. Proper supervision is advised. Zanies Neon Big Yelpers Dog Toy - Hot Pink Customer Photos - Send us your photo! This was the first toy she had as a puppy and she still loves it to this day (almost 3yrs old). She loved having it while waiting at DIA for our flight to start boarding..... She loved being "home" for the holidays! Posted On 01/18/18 by Claudia H from , Yes, Claudia H recommends this product! Lucy loves her new pink pup. Constructed well, bright, cheerful color and not too big, not too small, just a perfect size for any dog. This cute plush toy might also be great for that special little human girl in your life as well. Sofia loves her new dog toy. Fast shipping! Posted On 06/24/16 by Sonia L from Los Angeles , CA Yes, Sonia L recommends this product! My four pound chihuahua loves this toy! She has so much fun playing with it! Definitely reccomend it. Posted On 03/04/15 by Sandee L from Bullhead City, AZ Yes, Sandee L recommends this product! My dog loved it so much she would not let me take the tags off. She finally hid it behind the chair. Posted On 01/11/15 by Cheryl M from Anderson, IN Yes, Cheryl M recommends this product! I bought this as a small gift for another dog as a birthday gift. That other dog seems to really enjoy playing with it. She appears to think it was a super gift. Well made.